This is the third in our series of posts which illustrate how libraries contribute to a wide range of outcomes. Following literacy and culture, this week we look at the important role libraries play in communities. Libraries are open to everyone. Their staff understand their community’s needs and are trusted to provide reliable guidance and support on a wide range of issues when people need help. They provide a vital role in helping public services reach out into communities. They bring people together in vibrant community hubs which host local events and provide a shared sense of place for their users - something that is ever more important in an increasingly digital age. They also have an important role in reducing social inequalities; 36.8% of people living in the most disadvantaged areas visit their library. 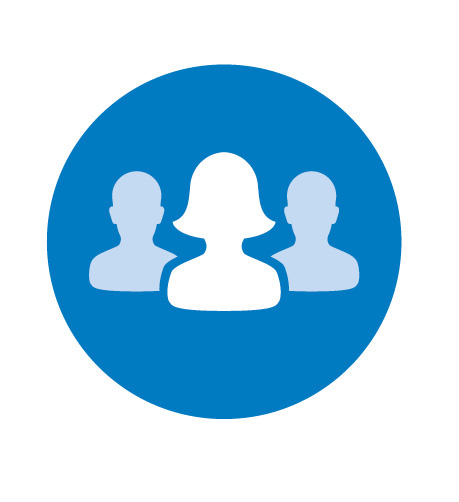 Below is the icon we have created to symbolise this outcome. To make it easier to spot related content, you’ll start to see this on material produced by the Libraries Taskforce that relates to work being done that supports this outcome. It’s freely available to download from this folder. Rather than just one case study, in this post we offer 4 and could easily have chosen many other examples. These are places we have visited or heard about from colleagues. This 1913 Carnegie funded building in one of the most deprived wards in Coventry was completely destroyed inside by an arson attack in 2003. It has been restored and extended since then, and the team have worked hard to create partnerships and shape their local service to meet community needs. They are committed to Positive Images, the regular festival which celebrates diversity in Coventry, and have run events to support it for the past 10 years. Events include dance, costume, language and Antakshri (a sort of Bollywood themed singing contest). 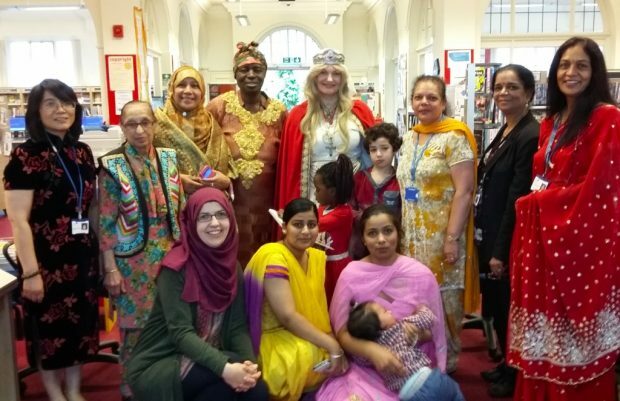 The photo below illustrates the diversity of the community, as staff and assistants dressed in their own national or local dress as part of the festival. A variety of local dress in Foleshill library: celebrating diversity. Photo credit: Coventry libraries. Partnerships include working with the local Somali community to run digital sessions with young people, with Midland Heart to run health awareness events, with the One Body One Life team to run family programmes, with Groundwork to run cook and eat well sessions, with Foleshill Women’s Training and Worker Education Association (WEA) to run computer classes and with the Brahma Kumaris to run a weekly meditation session. Outreach is an essential part of their work in the community, and the library has a regular programme with local gurdwaras, temples, carers groups, a Gujerati group and others. They work in total with 12 groups each month, and sessions involve a member of staff taking an outreach pack and books to the location for an hour, to encourage people to join the library and borrow books then. This tiny library operates in a space not much bigger than a couple of double garages placed end to end, but it is ideally placed at the heart of a community who clearly value its services. 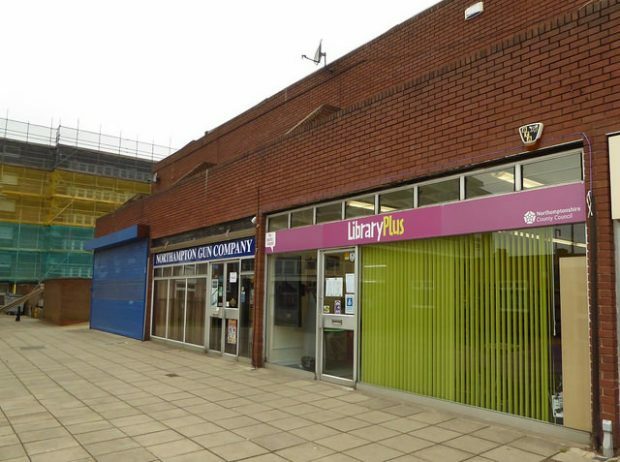 The library is opposite a community health centre, surrounded by flats and very close to Northampton’s rugby ground. They deliver a full programme of activities as their facebook page illustrates, including healthy eating classes, children’s crafts and a robotics club. They have a small garden behind the library which is designed and managed by volunteers. What attracted our attention during our visit was a beautifully presented handmade book that detailed a programme of activity that the library ran in summer 2015. They hosted craft sessions making things with a tudor theme, held sessions where participants learned tudor songs and dances, and finally went on a trip to Sulgrave manor - the home of George Washington’s ancestors. They told us they were planning a similar series of activities in Summer 2016, to celebrate the Shakespeare anniversary, to culminate in a visit to Stratford upon Avon. These activities are funded by a generous Friends group. 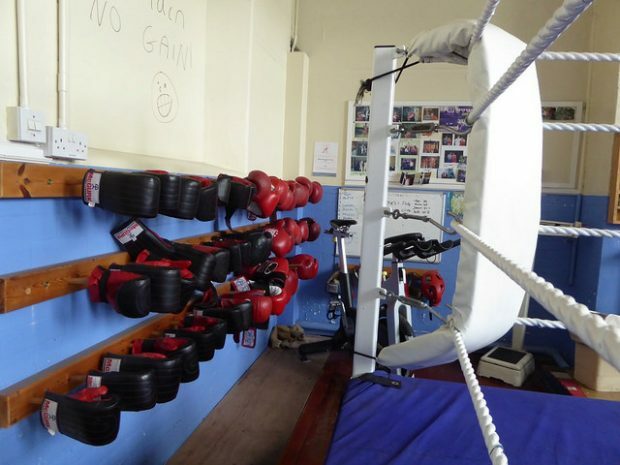 The Hub is in a deprived area of Middlesbrough, housed in a victorian former school, and contains a library, children’s centre, young people's services, dance studio and boxing gym. There are many rooms available to run community activities, and when we visited there was a lively craft group in progress, plus a meeting of a community group. In the heart of the building is a kitchen and open plan area, and the centre runs healthy eating courses. They also have an arrangement with a local bakery, and collect surplus produce at the end of each day that is made available free the following morning for locals to collect. The hub is one of several that represents a reorganisation of services in Middlesbrough. The library used to standalone in a small, fairly non-descript, building close to this location, and now it is more of a destination for a wide range of local people. Firth Park in Sheffield told us about their activities. Over the past 18 months, they have worked with SOAR (Southey and Owlerton Regeneration) to run a series of events. They use the whole library space and one of their Community Rooms to put out stalls for the participants to use to promote their organisations. They’ve run a jobs fair, learning event, health festival and 50 plus awareness day. One particular event was initiated by the Czech Slovak Embassy. In April 2015, as part of programme of similar events across the country, they ran sessions enabling people from these communities to be able to register for Passports and ID passes in the local community rather than have to travel to London. The event was held over 2 days, one of which would have been a library ‘Closed’ day. Both days were extremely well attended, with people from across the north of the country attending. In total, the most recent 5 events have attracted almost 3,700 people to the library. And it’s not just about numbers. Comments included: “it’s lovely to see the library used for community events, there’s a real buzz about the place” and “I now have 2 or 3 contacts to enable me to get out and about with my husband who has dementia, and we’ve both had a lovely time today”. Plus, Sonya Wild, the library officer behind these events, told me that she heard that 12 people had found jobs as a result of the jobs fair. 4 very different libraries, but each demonstrating their position at the heart of their communities. Keep an eye out for the story behind the Islington#50s (and #60s and #70s) campaign. A project that mixes material from the local studies collection with contemporary books, films and music, to conjure a sense of time and place. Next week, we’ll share how libraries contribute to greater prosperity, plus improved digital access and literacy.